Acknowledged author Linda E. McCuistion PhD RN ANP CNS wrote Pharmacology: A Patient-Centered Nursing Process Approach, 9e comprising 952 pages back in 2017. Textbook and etextbook are published under ISBN 0323399169 and 9780323399166. 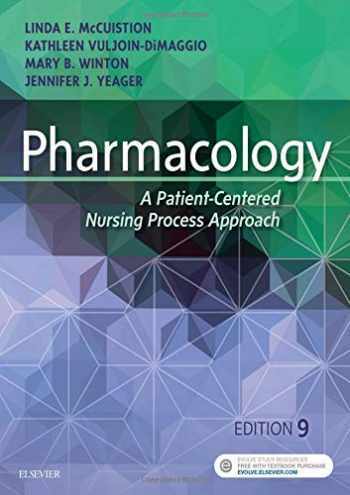 Since then Pharmacology: A Patient-Centered Nursing Process Approach, 9e textbook received total rating of 4 stars and was available to sell back to BooksRun online for the top buyback price of $37.28 or rent at the marketplace. Get the right dosage of pharmacology content to succeed on the NCLEX and as a professional nurse with Pharmacology: A Patient-Centered Nursing Process Approach, 9th Edition. Using a streamlined prototype approach and an emphasis on nursing care, this text makes it easy for today’s nursing students to better understand the complicated subject of pharmacology. The book’s detailed chapter on dosage calculation, the nursing process framework for drug therapy, strong QSEN focus, and summaries of prototype drugs help deliver the perfect pharmacology foundation. This new edition also features an improved overall organization, more streamlined content, updated prototype drug charts, a new chapter on transplant drugs, expanded information on cultural considerations, new and updated critical thinking case studies, and much more. In all, it’s the surest way to put your best foot forward when it comes to nursing pharmacology on the NCLEX and in practice!UNIQUE! An extensive, color-coded Drug Calculations chapter presents six methods of dosage calculation, providing a helpful review and supplement to a dosage calculations textbook.UNIQUE! Nursing Process summaries present patient care and drug therapy within the framework of each step of the nursing process, including information on patient teaching and cultural considerations.UNIQUE! Illustrated overviews of normal anatomy and physiology open each unit and provide a critical foundational review for understanding how drugs work in each body system.Chapter on safety and quality discusses medication errors, specific nursing measures to promote safety, National Patient Safety Goals, and many other safety issues and concerns.Cultural considerations icons highlight important cultural considerations in the Nursing Process sections.QSEN focus emphasizes patient-centered care, safety, quality, and collaboration and teamwork.Application-level NCLEX Study Questions at the end of each chapter help prepare readers for the growing pharmacology coverage on the NCLEX Examination.Consistent RN-standard chapter pedagogy includes objectives, outlines, key terms with page references, and activities on the Evolve companion website. Coverage of prioritization throughout the text helps readers learn to prioritize nursing care and differentiate need-to-know from nice-to-know content.NEW! Streamlined content and improved organization makes this edition even more user-friendly.NEW! Patient Safety boxes reinforce concepts related to medication safety, and more. NEW! New chapter on Transplant Drugs discusses key drugs prescribed for organ transplants.NEW! Updated Prototype Drug Charts provide easy access to key information for the most commonly used drugs, including dosages, contraindications, drug-lab-food interactions, pharmacokinetics, and more. NEW! New pregnancy categories regulations are addressed in all chapters where pregnancy categories were mentioned. NEW! Additional QSEN icons will be included in boxes that discuss patient-centered care, teamwork and collaboration, evidence-based practice, quality improvement, safety, or informatics.NEW! Expanded chapter on cultural considerations now includes new information on community-based nursing content.NEW! Complementary and Alternative Therapies boxes (formerly Herbal Alert boxes) more appropriately reflect the content, which covers more than just safety information. NEW! New or updated Critical thinking case studies are included at the end of every chapter to challenge readers to apply knowledge and analytical skills to realistic patient scenarios.